Fancy the performance sailing there are a set of 3DL sails in very good condition available for the boat by separate negotiation. Washed and valeted by North Sails UK October 2017. A wonderful performance cruiser, this Dehler 35 is in fantastic condition like new as you would expect! she was very easy to move around and would be perfect for a performance sailing with comfort or fast cruising. Fancy the performance sailing there are a set of 3DL sails in very good condition available for the boat by separate negotiation. New in March 2012, she has been sailed two-handed for 1-2 mid-week days most summer weeks, as conditions and life constraints permit. She has had few extended cruises, usually one or two trips to Alderney each year, due to lack of time. She has raced once at Dartmouth Regatta in PY class in 2013, and competed in six double-handed races run by RSYC in the Solent, winning twice in Club Class. She is set up for short-handed sailing, with some adjustments made to backstay and mainsheet traveller controls to ease helmsman’s use. The yacht is a Dehler 35 Elegance model, very highly equipped. She has a teak interior, with comfort cushions in front and rear cabins, plus Eberspracher heating, giving a very warm and welcoming ambience, and a large removable teak cockpit table for sunny evenings. The deep competition lead keel of 2.15m gives great lift and control upwind and on close reaches, and the large composite single wheel enables fine control of steering. Electric winches for anchor and main halyard plus Dehler Maindrop system make easy handling of heavy items. The Selden single-line reefing system cleverly uses movable pulleys in the boom to reduce the amount of rope required to reef the mainsail. All in all, she is very easily handled by two people. She is also an extremely pretty yacht, with modern cruiser-racer lines that do not age. She has been a joy to own. The yacht sails exceptionally well, easily the best yacht to sail that I have owned. She rides the waves well, and seems to sail like silk on all points of sailing. She will sit at 6.5 kn upwind in 10kn+ of wind, rising to 7.5 kn on beam and broad reaches, reaching 8 kn+ in stronger conditions. Under engine, 6.5kn at 2,200 rpm in flat water is normal; fuel consumption is 3-4 litres/hr dependent on speed. The large carbonesque steering wheel together with the high-quality Jefa steering gear gives very precise steering control. The original North ACL main and genoa sails are still in good condition, and the North asymmetric spinnaker really pulls the boat along well. In 2014, I purchased (very expensive!) North 3DL Marathon main and genoa sails (which are avaible by separate negotiation). These are really excellent single-piece moulded sails, lighter than ACL, and genuinely make the boat point higher, heel less, and go faster. They also make raising and lowering the mainsail into the Maindrop system much easier. They have proved a very good investment, and still have years of life in them. I use the ACL sails in the autumn and spring, switching to the 3DLs for the summer. The electronics are all linked together: B & G Triton displays, B & G Autopilot, Raymarine e7 chart plotter, plus AIS receiver all combine to give an integrated view of boat performance, location and routing, and the presence of other ships. Set mainly on the cockpit garage, they enable the crew to manage all navigation and performance without having to go below. All electrics have been very reliable since new. In summary, she is a unique example of a famous brand of high-quality, high-performance cruiser-racers. She is very well equipped, has been well cared for, sailed lightly but keenly, been a joy to use and stay on. With her good inventory, good looks and great performance, she has given enormous pride of ownership to its only owner. She will suit any enthusiastic sailing couple who look for the same attributes in their sailing. 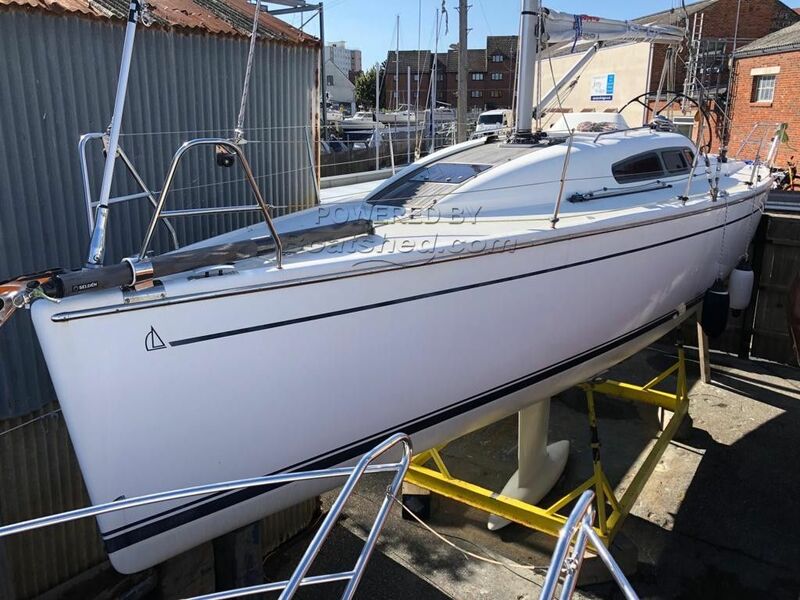 This Dehler 35 'Elegance' has been personally photographed and viewed by Samantha Cassell of Boatshed Portsmouth. Click here for contact details.